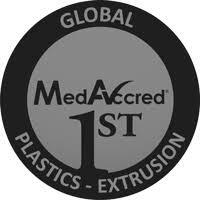 Plastics Extrusion has been added to the growing list of audit opportunities available through MedAccred. This newest opportunity, Plastics Extrusion, comprises audit criteria which covers Tubing/Profile, Sheet, Film, Blown Film, Over-Jacketing, Co-Extrusion and Ram Extrusion. The audit criteria are developed by leaders in the medical device industry who are part of the MedAccred program and are focused on improving product quality and patient safety. Sunlite Plastics of Germantown, Wisconsin USA has become the first manufacturing facility in the world to achieve MedAccred Plastics Extrusion Accreditation, with a Scope of Accreditation covering Tubing/Profile Extrusion. Following the MedAccred audit, technical experts from leading medical device companies reviewed the audit findings and corrective actions before voting on granting each MedAccred Accreditation. Other companies are now looking to gain Accreditation to the new MedAccred Plastics Extrusion audit criteria.